The East Coast has the Jazz Dance Party. The West Coast has Vintage Car Shows. Love it. Great photo! It is nice to see that it is warm somewhere! Yes indeed, and he is a cutie. The color has a definite McCurry. feel to it. Did you snag some techniques from him during your interviews? Amazing pic. Love the retro style look and vintage cars. that is one epic sweater and i love the twirl that’s happening in the background. It’s so obvious you’re having a GREAT time in Las Vegas. There is such joy in your photos. I like the picture and the colors, but I don’t his style. Not at all. But he’s got a nice hair and a nice face I guess. ps. Scott don’t join any rodeo, nothing with animal abuse involved. I would choose the burlesque dance or surfing maybe. Awesome sweater and love his jeans too! Looking Hella good in the sun! Great pic, love the blurred background. The yearly event features a different decade in motorsports history and the spectators are strongly encouraged to dress to the period. Most oblige enthusiastically! It is easily one of the best motorsports events I’ve ever attended. I love this. It reminds me of my jive dancing days in London. And how I wish I could have a dance with this fabulous young man! Great guy, who is a friend from my dancing days. :) He is a great musician and dancer! Love his look, that’s a killer sweater tee! Great to see a photo of a friend of mine. :) Viva Las Vegas is a fun event! I want the shirt / blouse. Ha! That’s my cousin!!! Coooooooooooool!!! 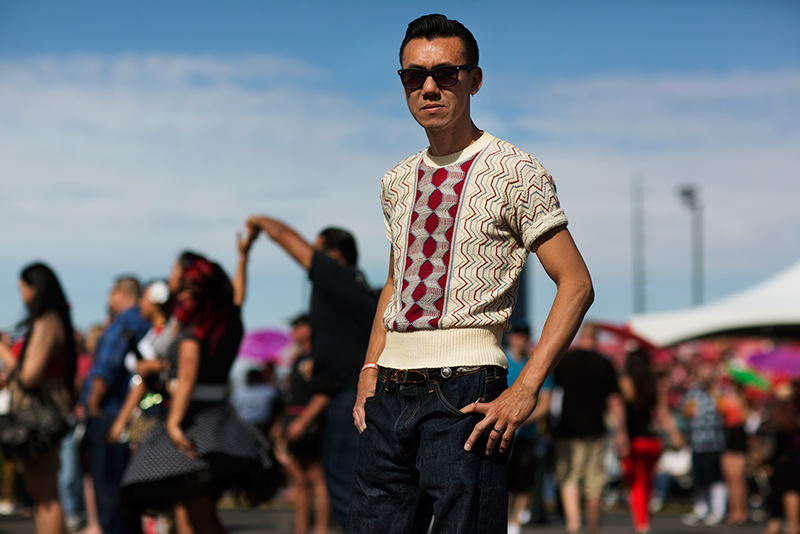 A tire-tread patterned sweater; most appropriate for a car show. Scott, Thanks for taking my pic and posting! It looks great! I’m amazed… some of the shots look quite time consumingly “staged” but I can attest he captures these moments within seconds of asking to take the pic (mine, he took 20 seconds of my time). It just goes to show you his artistic talent, flair and “eye” for photography, fashion and art! I’m a new fan! I adore those rare mens knit patterns from the period. And raw denim from 100% in these skinny jeans times. What a show! Truly inspiring. 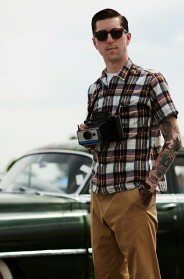 The gent is stylin’ a 1940′s Ohio Knitting Mills poorboy shirt! We have many more examples of our Raschel knit shirts in our company archives. Super hot! Does everyone at Viva Vegas have tatoos? As much I enjoy vintage…I think the key to enjoying wearing it is not to take the folks with a thousands tats too seriously. Agree? That said, I’m loving this machine knit sweater on this guy. Short sleeves too! 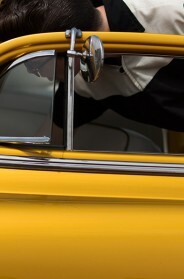 Now that is a vintage car show I could enjoy any day. What fun. I need to visit Vegas again soon. If only to catch sun sunshine, soak up the warm weather.